The Springs Craft Beer tour was fantastic!! About 2 hours total, and worth every minute! It was a Manitou Springs walking tour with stops at a few of the local establishments, and multiple beer tastings. Our tour guide, Russ, was extremely knowledgeable about the history of Manitou Springs, and provided us with short stories and fun facts about the town that kept things interesting. Our path crossed through a penny arcade, and there were a couple of other stops along the way where we were given some freebies from local vendors! Truly, just a fun walk through town! The servers at the beer spots were great and gave us a lot of information about the various beers they were serving. Great tour and great way to spend time in the Springs!! The beer alone was worth the cost of the tour!! I highly recommend it!! 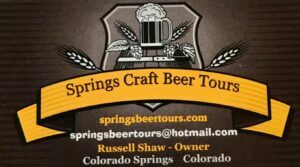 Enjoy a friendly neighborhood, approximately 2 hour, guided walking craft beer tour of the quaint mountain town of Manitou Springs. Along the way we’ll sample some of the finest Colorado craft beers, share a little bit of local history, talk about the local craft beer phenomenon and, make new friends. 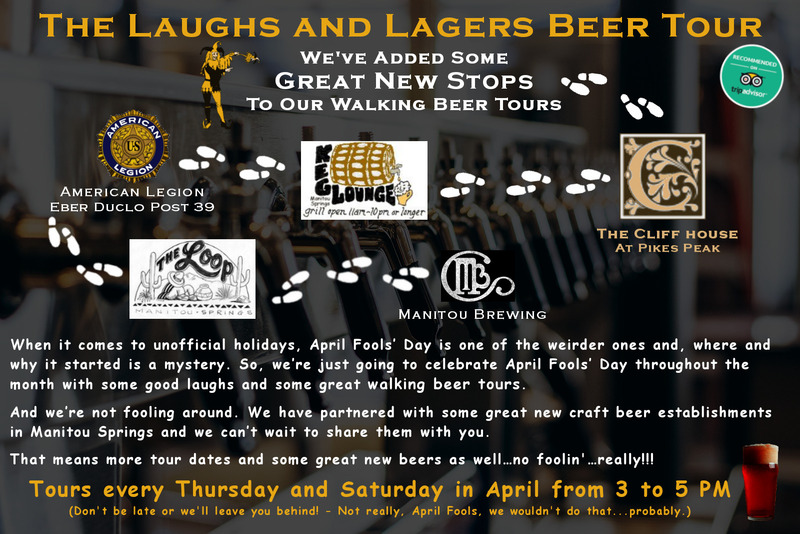 Most tours will include stops at some of Manitou’s best attractions and craft beer houses which could include Soda Springs Park, Cheyenne Spring, Patsy’s Original Candies, the Penny Arcade, the Cliff House and Manitou Brewing Company. Our tours average 3/4-1.0 mile in distance and possibly some steep elevation. Whether you’re new to craft beer or been a fan for ages this is the tour for you. Unlike bus and van tours our walking tours have little impact on our carbon footprint. So, elevate your Colorado craft beer experience visit with us! Our tours generally operate Wednesday, Thursday and Saturday from 3 P.M. through 5 P.M. We do require a minimum of 4 persons up to a maximum of 12 persons per tour. Please arrive 15 minutes early so that we have time to get everyone checked in and get our tour started on time. If you desire a tour outside of our regular days and times, feel free to contact us and we will work with you to design a custom or private walking tour for your group. Colorado weather can change in an instant so please ensure that you dress appropriately. We recommend that you bring an umbrella if there is even a hint of rain. If for some reason a tour is cancelled due to weather we offer a full refund or priority placement in the next scheduled tour. There is a free parking lot at 10 Old Man’s Trail just across from Memorial Park. From the park a free shuttle will take you the short distance to downtown Manitou Springs. Shuttles run approximately every 20 minutes. For more information on parking, shuttles and directions, please go to the Manitou Springs website at: https://manitousprings.org/whats-happening/parking-information/. 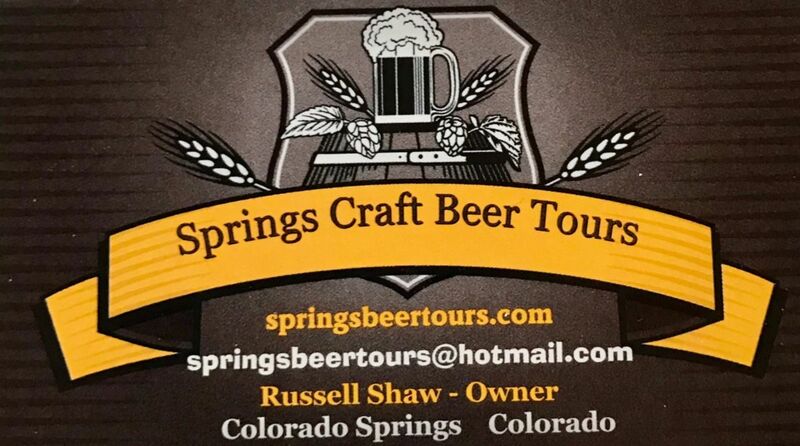 Springs Beer Tours offers a credit for another tour if you miss your scheduled tour. Please be on time as the tour begins promptly at the time scheduled. Be courteous to tour group members. Follow local and state traffic codes by using cross walks. Respect each other throughout the tour. Have fun! You must be age 21 or over to purchase tickets for any of our beer tours. You must be age 18 or over to purchase tickets for our Prohibition Tour.